You don’t have to know how your digital camera works to enjoy it. But knowing a little helps you to enjoy it better. [Image taken from the video]. Those who know the world famous TV show, Top Gear know James May . He has a zany sense of humour. Recently he’s been doing simple science videos. 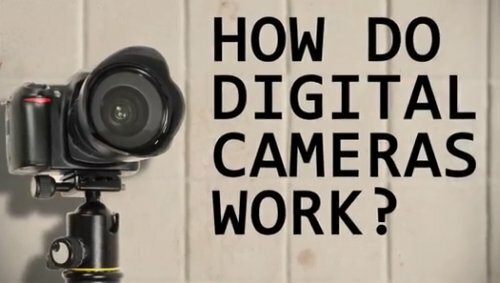 In the video he shows how digital cameras work. Off-hand jokes and jibes at Richard Hammond make the fast-paced video fun. Watch and learn how your camera works. How digital cameras work. With James May. The history in the video is a bit misleading. How digital cameras work was worked out in the 1970s. By the 1980s sensors were quite advanced. But, it was not until the 1990s that digital image sensors became consumer items. Then camera makers made them small and cheap. To find out more see: A History of Photography (pt.6). The Digital Age. Mr. May gets the idea of a pixel wrong too. He talks about pixels being on the sensor. Many people have this idea. Pixels are in images on screen. Data for digital images is collected on a digital image sensor. Each point where the data for each pixel is collected is called a photosite. Just remember, photosites collect data on the sensor. Pixels display the data in the image on the screen. For some more context on pixels in your images check this: Getting down to pixel level. Snowflakes are intricate and beautiful. They are a source of interest to scientist – but photographers can make amazing pictures with them. The perfect six-sided snowflake exists, but is not the only sort. Early snowflake pictures were taken by farmers’ son, Wilson “snowflake” Bentley (February 9, 1865 – December 23, 1931) from Vermont. Aged 15 he was captivated by snowflakes. It started with looking down a microscope. But in 1885 he began experiments with a camera too. After struggling with the early camera technology he began to make some progress. During his life he made thousands of photos of snowflakes. His work still dominate our ideas today. In particular he was the first to claim snowflakes are unique and six sided. His pictures are also some of the best too. 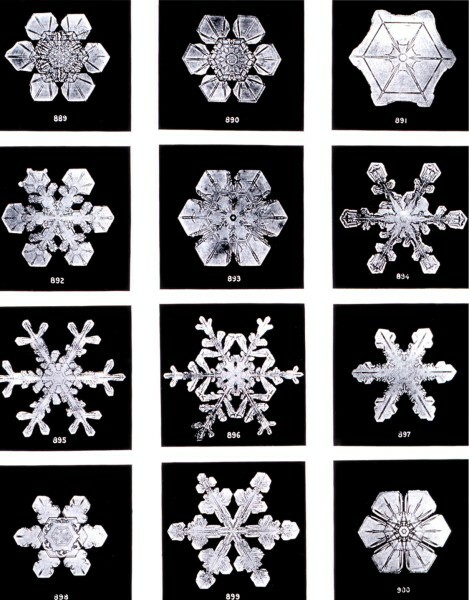 Wilson “Snowflake” Bentley was famous for his snowflake photographs. Nearly a century after his death we are still using the images. 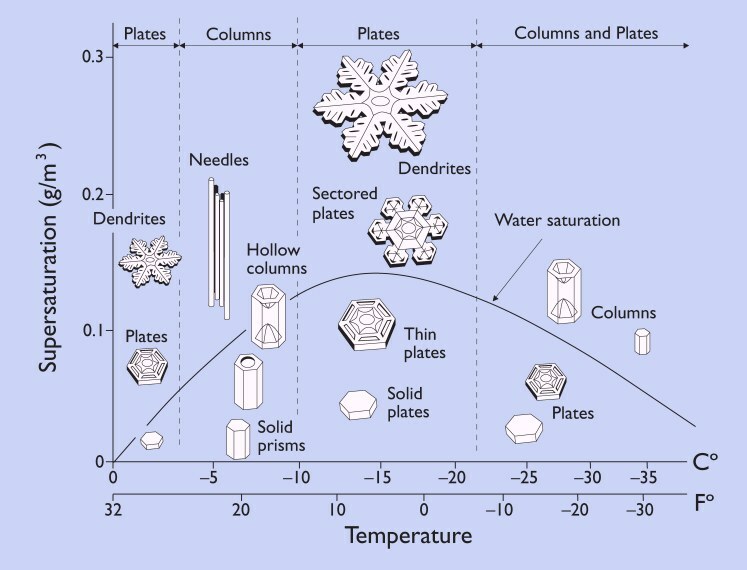 Here is detailed morphology diagram for snowflakes . It shows the relationship between the snowflakes’ type and temperature/humidity. Snowflakes go through a range of temperature, humidity and other changes while falling. They have a unique and sometimes violent history. They clash together. They may ball-up with other flakes. It’s common for them to have multiple crystals joined in one flake. They may circulate in the clouds for long periods. They may also melt and refreeze before descending to the ground. It is not a surprise they are all so different. 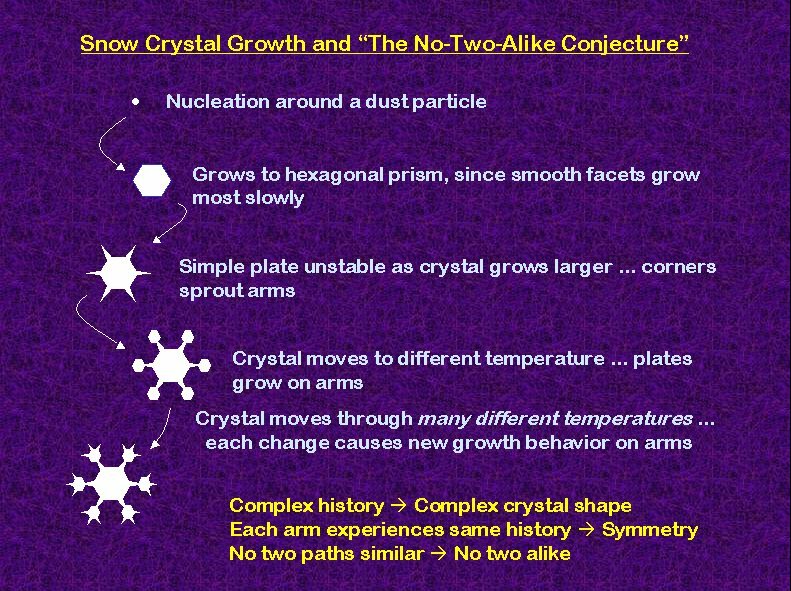 There is a great infographic on SnowCrystals.com showing snow crystal growth and the no-two-alike idea. You can’t easily photograph snowflakes on the ground. The overall white in a snow mass makes it difficult to distinguish individual flakes. The small size makes them a challenge too. The best approach to snowflakes is two-fold. Use a macro lens or macro extension tubes. Use a clean (new) long hair artists paint brush. Sable hair is best. Use a small black velvet cloth (about 500mm x 500mm) to see the snowflakes. The aim with these is simple. Tease out individual snowflakes onto a black background. Then get in close with the lens. If you are working with a macro lens help yourself out and use a tripod. The snowflakes themselves are easily destroyed. The trick is to use the artists brush to lift snowflakes onto the velvet. The brush and velvet have hairs that support the snowflake without damage. Be as gentle as you can to preserve its delicate nature of the crystal. Sadly tiny ice crystals tend to go grey when on a black background surface. When shot on a dark background they are best converted to monochrome. This helps to increase the contrast and definition of the crystal. To show the beauty of the refracted light use a well-lit background. If you can, place the snowflake onto a glass slide delicately lifting it off the velvet. You can buy Blank Slides – Microscope accessories from various places. Make sure you have left the slides to cool down to the snow temperature or the snow will melt on it. Be sure to keep your cloth, brush and slides cold and dry. Make sure your breath is not directed at the snowflake. Even slightly raised temperature or humidity will affect the snowflake while you are trying to photograph it. More than once I have had them dissolve in front of my eyes. If you are using an actual microscope, or if you are using a glass slide try to get some backlighting. To get the best refractive results try light at different angles on the snowflake. The best results are not necessarily when the light is directly from below. The angled light tends to create contrasts on the snowflakes. This brings out light and dark as well as some aesthetic colourations from refraction through the crystal. This an affordable and well reviewed digital microscope. It will do detailed images direct from your computer. It’s a photography tool which provides an opportunity to develop your macro skills. Hours of fun too! 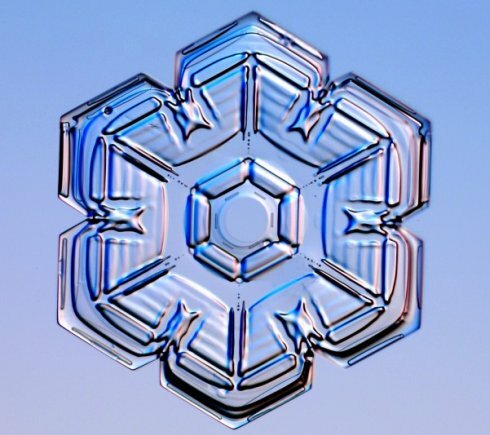 One of the acknowledged masters of the art of shooting snowflakes is Kenneth G. Libbrecht . He’s a professor of physics who researches crystal growth. He also runs the SnowCrystals.com website. There are wonderful resources on the site including a “how to guide” and many hints about photography and equipment. There are some wonderful galleries of images . There is also a section on how to grow your own snowflakes. Although, the latter was a bit more complex than I think I would go… but who knows. People in this field seem to get obsessive about it. Snowflakes are extraordinarily beautiful. Official Snowflake Bentley Web Site. This site houses the Wilson “Snowflake” Bentley photographic collection. A quality, versatile and robust tripod – the Manfrotto 055XPROB Tripod is unbeatable as an all-rounder. Buy a good tripod – you will not regret it! Can you recommend a good tripod? Nothing beats a good tripod. Most people forget about them until they have struggled for a long time. Then they buy a cheap one. Later they have to think again. Well, I suggest you buy a good tripod now and save yourself strife down the line! I have recommend a good buy at the page end. Why buy a good tripod? There are other reasons to buy a good tripod, but you get the idea. Nearly every aspect of camera stability is reduced to keep the price down. I am not one to advocate gear lust or spending money where it is not worth it. However, I have come across each of the design and quality flaws above. From personal choice and experience it’s clear only the best is good enough when making your camera stable. While a quality tripod is great, you normally need to buy a good head too. Cheap tripods usually without them, or have poor quality ones. A good tripod head is an investment for life. Inter-changeable heads are very useful. I have five heads for different purposes: for macro work; small cameras; panoramas; and one for precise adjustment. My most versatile head I use every day for general purpose work. The Manfrotto 322RC2 Heavy Duty Grip Ball Head is precise robust, reliable, versatile and has never let me down. So which tripod do you recommend? This is a robust, and well designed unit with strong legs. It comes as a legs and platform – ready for your inter-changeable head. The black paint is hard wearing and will not create odd light effects. The two comfortable hand grips are essential in cold weather. The legs and centre column are adaptable to a wide range of angles and heights. 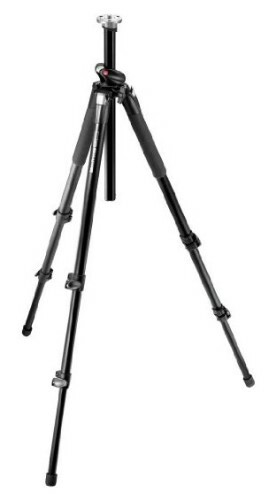 The Manfrotto 055XPROB is a great tripod and would make a wonderful present for a DSLR owner. It is on special offer on Amazon. Buy one now. Tripod myths – why are amateurs tripod shy? There is a gap between pushing the button and the making the photo. There’s a period when not much happens. Lag time is the total time taken for the camera to complete the exposure process from the button push. In that process is a lot of detail. Here we look at lag time. With a simple test you can get a feel for the lag time in your camera. Why is lag time important? If you buy a camera for action shots you want minimal lag time. Otherwise you look and press, but the action has gone. Of course you can anticipate the action. This is how we all deal with lag time. But to know what time to anticipate you need a feel for the camera. A long lag time is likely to make your guess about when to press the shutter button less accurate. So it’s in your interest to know the lag time and practice with it. If you know the lag it makes it easer to guess the delay for shots. LCD activation of the picture (LCD display and electronic [mirrorless] viewfinders only). Thinking time between seeing a subject on the display and the finger push on the button. Time taken to get a focus. Aperture – time to calculate & set aperture size. Meter – time from light reading to exposure set up. Digital sensor start up to be ready. Digital capture of light data. Data emptied from sensor ready for next exposure. These items may overlap, run simultaneously or be in sequence. Some may not apply to some cameras. It depends on the camera model, design, efficiency and the components involved. This list adds up to the total lag time. The first five items are not shutter related. They delay the firing of the shutter. They are shutter delay times. The other items are shutter lag items. They are responsible for the shutter and sensor capture of the exposure. They determine the shutter process from start to finish. These are the shutter lag items. To be clear, lag time is the sum of all the lag items. Shutter lag is only those items related to the shutter-sensor system. In order to know your camera better you can actually measure your lag time. So here is a method you can use at home. I have tested it using two different pieces of equipment and on two cameras with good results. A word of warning. The on-board flash crosses all the other lag/delay times and may extend your total lag quite a lot. This is because it takes time to charge up ready for the flash. It will affect the results. Before testing turn off your flash. Check your manual if you are not sure how. Both these methods have back-lighting. You will get enough light without it. Explanation/method: to measure the lag time we need to identify all the processes involved. I have done this for you above. This allows you to know what parts of the process are holding things up. You will see later that can help you save time. Next we need to find a way to mark the start and end of the process. Fortunately the camera helps us. When the shutter button is pushed we know the exposure process is started. The clever part is that if we photograph a timer we know when the exposure process is finished because the clock will show the finish time. To find out our lag time is easy. We activate a clock at the same time as we push the shutter button. We do this while photographing the clock. When the shot is taken the end of the the lag time is shown on the photograph. In the photo “Test one” above I have used this method with my smart phone. I set up the stop-watch app on my phone. Then I pushed “start” with my left hand. I simultaneously held the camera and pushed the shutter button. The key is to make sure you set off both the timer and shutter button at once. If you do, the the photograph will show the lag time. In the photo above it shows 69/100ths of a second. This is my lag time for a photo taken on my little Canon G12. Use a tripod or stand if holding your camera and pushing the button at once is not steady enough. This page will allow you to test your Digital Camera’s shutter lag… . (Note: this page is about your total lag time even though it refers to the shutter lag). Test your Digital Camera’s lag time . Follow the instructions on that page. You will see a very slight retard on the clock at the ‘zero’ point. That gives you time to notice the top point and press the shutter button. The resulting photo will tell you the lag time on your camera. I have run tests on my camera using both the web page and the stop-watch app method. They give consistent results. I feel confident you will find either test will work for you. Notice on the second test page there are two tests. The second one shows you how you can shorten your lag time. If you pre-focus the camera that saves some pre-shutter time. Focus takes quite a bit of time. So if it is already focused when you take the shot your lag is reduced. To reduce the delay with pre-focus press the button half way down while looking at the clock. 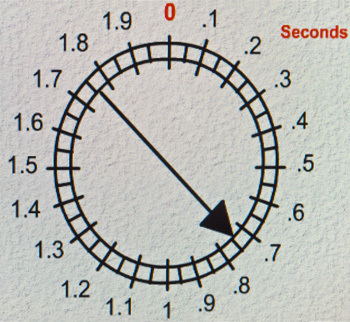 The camera will focus and take meter reading. Then you can hold the half way position – this is called focus-lock. Hold your half-down position until, at zero. Then push the shutter button the rest of the way down. You will normally find your camera lag time is greatly reduced. Possibly by as much as a half. Something to bear in mind for future shots. Of course you might take a totally bad reading for your fist shot. After playing I found that for both methods you need to practice a little to get consistent readings. If we divide the total by ten we will get an average reading. It will iron out any anomalous readings. Thus: 7.07÷10 = 0.71 (rounded to two places). The lag time on this camera is therefore 71/100ths of a second. This ‘average’ method provides us with a consistent standard over our readings. This is a more accurate method of gauging the lag time. The things a modern camera does to take a picture has created a long lag. The lag time is the sum of all the different things that impact the exposure process. From button-press to complete capture-of-data is the lag time. 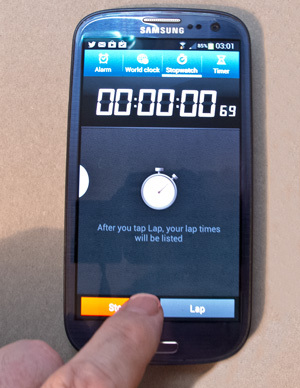 We have looked at two ways of testing the lag time: a stop watch app; and a web page timer. I have also suggested using an average reading to iron out anomalies. If you go through this process you will know your camera much better. But more to the point you will have a new confidence. You will know how long it takes to complete an exposure. And, you will know how much time to delay for a shot. Damon is a writer-photographer and editor of this site. He has also run some major websites, a computing department and a digital image library. He started out as a trained teacher and now runs training for digital photogs. Dirt and grit is a camera killer. Prevent it from getting into your kit. Dirty photography gear will stop working. It is surprising how much dirt will get into your gear. It’s a kit killer, damaging everything. You can prevent it with care. You will save a big expense down the line too. There is no doubt your equipment will get dirt on it. Even simple shoots can get close to dirt. Outside it’s almost certain that dust and will get on your kit. In Summer photogs use cameras on beaches, in fields and many other dusty environments. What should you do to protect your kit? Observation is the key. Keep an eye open for anything dusty around you. Be particular about sand and grit. If you get those in your camera you will suffer a huge clean up problem. Sand and small dirt particles will get under the focus rings on your lens, under the lens cap and possibly into your camera body. There are two key points. Secondly, pay attention to your clothes and other equipment. Yes, that’s right. The biggest danger to your camera is transference. Your clothes, shoes and other equipment collect dirt particles. I first noticed this problem when changing a lens in the boot (trunk) of my car. I put a lens down on my coat to put on another one. As I put it down a cloud of dust puffed out from under the coat. The dust caught in the sun as it drifted out. It occurred to me that all sorts of outdoor items go in the car boot. It is a dusty place. When I swept the carpet I found all sorts of particles. These came from boots, coats, ordinary clothes and other equipment. If you have pets the problem is much worse. Looking more closely I also discovered my tripod was a source of grit. After shooting on a beach I had just put it back in its bag. There was lots of dirt and grit in that bag. Looking more closely, sand and dirt had got into the legs of my tripod too. Where I had clamped them shut the sand had left scratches and damage on the paintwork. When I shook the tripod I could hear dirt rattling inside. 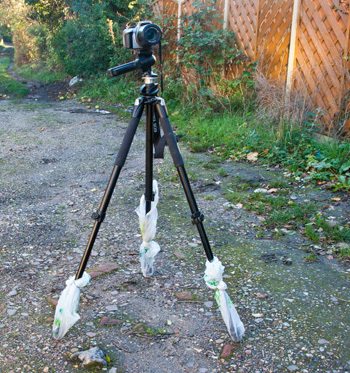 After that I looked for ways to keep the tripod feet clean. The result can be seen in the picture above. Where dirt or grit is found I use a rubber band and plastic bag on each leg. Before putting the tripod away I simply remove the bags. I dispose of them sensibly. Nothing is transferred into the camera kit. Most of our equipment can be damaged by dirt. The hidden routes to getting it into our camera are all around us. Try to change lenses and store your equipment in clean and cleanable places. Try to find ways dirt can be transferred into your bags and storage places. Find simple ways to eliminate it. In the long run it is cheaper and more convenient to protect than to pay for repairs. Research photography cleaning equipment. . 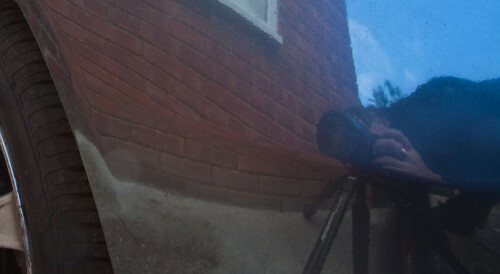 Dirt on your camera, or worse, on your digital sensor? You need this tool. An efficient blower, the stream of air will clear dirt and grit from damageable places. Use it to clear dirt from the camera sensor and to blow out dust . It is an indispensable tool for the keen photographer. Giottos Rocket Air Blower – Black. Research photography cleaning equipment . Giottos Rocket Air Blower – Black . Damon is editor of Photokonnexion. He has professional experience in photography, writing, image libraries, and computing. He is an experienced, webmaster and a trained teacher. Damon runs regular training for digital photographers. By Damon Guy :: Profile on Google+. As Fall is upon us. Think of new ways to pull in the eye of the viewer. Autumn is a great time of year. There is so much to see and photograph. Being out in the open air and lovely locations is part of the attraction. Here are some other important and photographic things to consider. Don’t always go to the same spot. Find somewhere new every Autumn. Fall colours depend on the species, which may not be shown on maps. Check with park information centres to see if the colours are right. Information centres are great at giving directions to the best locations. Watch weather forecasts to see when the best light is likely to show up. Check websites for the area near the location for useful information. Even slight greyness in the sky can dampen the colours. Bright colour can be lost against a bright sky, exaggerate colour contrast. Shoot yellows against a darker background so they don’t get lost. Golden colours are best with a red dusk. Aim for times in the Golden Hour. Don’t use a pop-up flash. It will flatten the colour and depth. Use off-camera flash from the side to make leaves translucent and bright. Use side light as much as possible to emphasis shadows and define shapes. Use any greens you can as a back-drop for golden colours. Low sunlight peeping under clouds often brings out yellows. 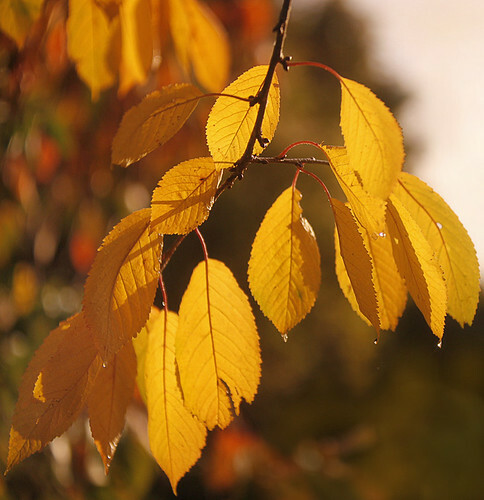 Take pictures after rain – the wetness often revitalises colours. Consider a filter on your camera to exaggerate natural colours. Try shots with as many mixed colours as possible. Try shots with lots of similar colours across the picture. A tripod is essential. A fuzzy shot of a great scene is horrible! Most people forget the wide angle shots. Remember that zoom lenses flatten perspective – consider prime lenses. Consider using white boards and gold reflectors to help bring up colours. You can’t make great images if you are cold/wet. Wear proper clothing. Beware of changing lenses in damp air! Check out our resources on composition. Before going spend two hours looking at images by others (Google) . Work out a list of, say, 25 shots you would like to try out. Concentrate your efforts on a few ideas. Use your trip to try at least one type of shot new to you. Practice your chosen shots before you go. Remember to work the scene at the location. Remember The fifteen second landscape appraisal. Have a go at this old sailors trick to improve landscapes. People often look up when in trees. Look down, there is plenty there. Experiment with Depth of Field:. Light leaves from behind. Translucent leaves are wonderful. Consider backlighting to bring out shapes. Hold up something interesting and photograph it with your hand. Dogs look great in leaves! Capture your pet having fun! Take a macro lens or macro tubes. Get really close. Look for golden, yellows and reds in reflections… they look great! There is nothing more exciting. Get great images knowing they came out the way you intended. Avoid ‘auto’ shots programmed by a boffin at the camera factory. The Exposure Triangle – An aid to thinking about exposure. Don’t be so intense that its not fun! Love your trip, enjoy the moment and if possible share it with a friend. Make some great images along the way. Posted on October 16, 2013 by Damon (Editor) | Comments Off on Tripod myths – why are amateurs tripod shy? quick, effective and give great results! Tripods improve your results – fact! What are the tripod myths? Tripods are too much bother. I can shoot great shots hand-held. They are cumbersome, get in the way and heavy. It’s not possible or easy to use it all the time. I am sure there are other issues. But let’s look at these in detail. Tripod myths: Missing the moment? Every photographer gets lucky sometimes. They happen to point the camera pointing right and, snap, they got it. Let’s be honest. How many times does that lucky capture happen? “Journalists?”, I hear you say? Actually, they rarely get lucky either. Photo-journalists train in preparation, planning and investigation. Being there and aware when the event happens is not an accident. They get the story time and time again. If you plan for your tripod you will get the shot too. You won’t miss the shot getting your DSLR out either. Forethought and planning are good photographic habits. Cultivate and develop these skills. You get the shot, and it’ll be sharper. If you are going to shoot, do it properly. Have both camera and tripod ready. Don’t be a victim of tripod myths, be in control of your photography. What can be too much bother about getting a sharp, properly framed image? Loading a tripod is no more trouble than putting your camera in the car. It takes only 15 seconds to set up. The tripod will also give you time and scope to take a great shot. It holds your camera for lens changes and while scouting the next shot. Bother? Not really. Bothered people think tripods are hard work. Do they realise how much the picture is improved? Attention to detail over your shots is what makes excellent images. Taking a quick snap may be no bother. Its unlikely to yield a great image either. This is one of the tripod myths that does not stand up! There are lots of situations where great light and a steady hand can get a sharp result. Congratulations. The time and effort you put into your photography is paying off. However, of all the situations I take pictures in, only about a third can be hand held. High ISO might help. More likely digital Noise would spoil the image. Better to take a longer exposure and use, say, ISO100. Quality is important. Tripod myths will limit you to one third of your potential as a photog. It makes you a limited photographer. Tripods extend your shooting time, flexibility and quality of image. Yes, finally, a fact! Tripods make you think about your photograph. Perhaps not one of the tripod myths, more of a tripod mistake. Since digital cameras became common I see a lot of machine-gun photography. A keen photog arrives, sprays off a hundred shots… Then, off they go. Wow. Spend the first few minutes considering options. Proceed with a plan and with care. Cover all the shots you need. Sometimes you will get new ideas. Great, get more shots. Later that week things turned around. He had eleven fair shots and one really good one. He had spent hours and hours in post-processing and missed lots of sleep. My more careful approach paid off. I had more than 40 quality images. As he looked at them he kept saying, “I took a picture of that too, but it didn’t come out”. And, “How did you get that one to look so good?”. My care, quality and composition paid off. The tripod helped me think about my photography and take care. I only spent about two hours in post-processing too. Most on simple tweaks. I had plenty of time for other shoots that week. One question… Who was really slowed up here? One of my regular jobs involves 15 – 20 finished pictures of a scene. Picture order and camera height is important. We often work in low light. Space is restricted at many sites. We are not allowed to do any post-processing. This is fast work. In 15 minutes I make up to 35 shots at a high enough standard to meet the needs of a court case. Does a tripod hold me up or prevent me working the scene? Does it prevent my shots? On the contrary. I could not do the job without it. I would have to take many more shots. My shots would be less flexible. I would not achieve court-ready sharpness and detail. Without a tripod I could not work the scene properly. Tripod myths: Cumbersome, heavy, intrusive? Sometimes. A tripod can be badly adapted for what you are doing. So, if you are going to do something a lot, buy the right tripod. Travel a lot? Get a light one. Work on beaches a lot? Choose sealed feet to keep the sand out. Working special scenes? Get a special tripod. General photography? Buy general. If you have the wrong equipment you can rightly claim it’s no good! So, buy the right equipment for the job. Make sure you get a quality piece of equipment. You spend thousands on your camera and lenses, so there is little point in spending only ten on your tripod. Quality workmanship and materials are important to producing quality images. You would not accept less with your camera so why with your tripod? This is one of the tripod myths that does stand up – if you have the wrong equipment. Get it right and you have a friend for life. I am not saying tripods are everything. In fact there are many situations where they are not suitable or you can’t use them. Also, we all enjoy the freedom and creativity of hand-held shots sometimes. If we fall prey to tripod myths we will never get past auto settings and bright daylight shots. All I am saying is, don’t limit yourself. Get past the tripod myths. Buy a tripod and make sure you know how to use it. Your photography will improve if you use it a lot. Use it only a little and you’ll pay a penalty. Manfrotto – Quality tripods for committed photographers . Comments Off on Tripod myths – why are amateurs tripod shy?